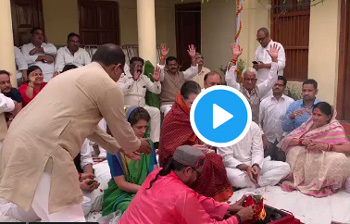 RAE BARELI: United Progressive Alliance (UPA) chairperson Sonia Gandhi filed her nomination papers from the Rae Bareli constituency for the parliamentary elections in Uttar Pradesh on April 11. The nomination followed a roadshow and a puja at the local party office. Her son and Congress president Rahul Gandhi, daughter Priyanka Gandhi Vadra and son-in-law Robert Vadra accompanied her. "Four time MP from Rae Bareli, UPA Chairperson Smt. Sonia Gandhi files her nomination for the 2019 Lok Sabha elections," said a Congress Twitter post. Sonia will face Dinesh Pratap Singh, who recently joined the BJP after leaving the Congress. The voting in Rae Bareli will be held in the fifth phase of polling on May 6. The Samajwadi Party and the Bahujan Samaj Party alliance in UP has not put up any candidate against Soni Gandhi as a mark of goodwill and an unwritten alliance. Congress president and Sonia's son Rahul Gandhi filed his nomination papers from Amethi parliamentary constituency on Wednesday. He is seeking reelection for the fourth time. Even as the BJP constantly attacks the Congress over its "dynastic politics", Rahul Gandhi held a roadshow accompanied by his sister Priyanka Gandhi, who in last January joined the party as general secretary, her husband Robert Vadra, and their two children, Miraya (16) and Raihan (18). Priyanka Gandhi Vadra was seen explaining Miraya about the scenes that were unfolding in the political battlefront. Priyanka's children will be the fifth generation of the Nehru-Gandhi family, after Independence, in politics if they join. Rahul did a three km roadshow that ended in the district magistrate's office where he filed his papers. Miraya and Raihan were the attraction of the show. Their selfies with mother Priyanka went viral on social media. The pictures are seen on the party's Twitter handle, captioned, "Smt @priyankagandhi shares a light moment with her children." Amethi will go to the polls on May 6, in the fifth phase of the polling.